Clue #6 finished with cute baby toes. It was just so cute, I din’t want to try for another shot! I wanted to update some of the bags that didn’t sell last year so I needle felted designs onto them. I had so much fun and they were so fast that I needle felted the coaster I had in my booth as well. Look It! I have the best friend ever! I sent this picture to Kami a while back telling her that I wanted one! She just texted me the other day that she was going to take a class on how to make it, and what kind of fabric I would like! 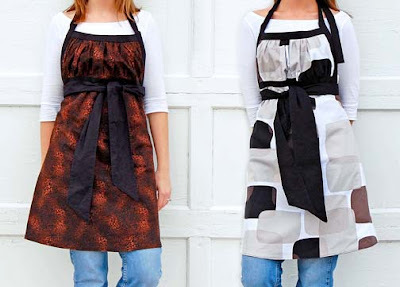 It is a double sided apron. I am so excited! Kami you are awesome! Look everyone, I am officially a designer on Ravelry! I know, most of you won’t be able to see this because you are not raverly members, but oh well, I was very excited!